We’d love your help. Let us know what’s wrong with this preview of The Incredible Origins of the Onyx Sun by Christopher Mahoney. The Incredible Origins of the Onyx Sun is an award-winning space adventure for young adults that has earned the acclaim of Publisher's Weekly, Writer's Digest, Amazon.com, and kids and parents everywhere. The book follows Zack Goodspeed, a perfectly normal 11-year old boy, who discovers his eccentric grandfather has invented a source of unlimited power, called the Onyx Sun The Incredible Origins of the Onyx Sun is an award-winning space adventure for young adults that has earned the acclaim of Publisher's Weekly, Writer's Digest, Amazon.com, and kids and parents everywhere. The book follows Zack Goodspeed, a perfectly normal 11-year old boy, who discovers his eccentric grandfather has invented a source of unlimited power, called the Onyx Sun and harnessed that power to fuel a spaceship. Stowing away on the ship with his mischievous neighbor Angelina "Max" Maximillian, Zack is thrust into a journey that strands him on the Moon, introduces him to bold new friends, and pits him against Dr. Machvel, a rouge member of crew bent on turning the Onyx Sun into a weapon of mass destruction. Through an imaginative storyline, the book immerses children in the possibilities they will one-day face to improve humanity through invention and technological exploration. It is a scintillating, roller-coaster ride of a story that helps kids also understand the nature of friendships, conflict, and personal growth. Publisher's Weekly applauds the book, saying "This space adventure yarn has the right stuff. The fast-paced novel keeps the reader engaged throughout. The main characters are nicely done, the plot is exciting, and there’s a clear jumping off point for a sequel, which young sci-fi fans would surely look forward to." This debut novel by Christopher Mahoney has also won an honorable mention in the 17th Annual Writer's Digest Self-Published Book Awards and reached the semifinals of the 2010 Amazon Breakthrough Novel Awards. To ask other readers questions about The Incredible Origins of the Onyx Sun, please sign up. Zack Goodspeed is a normal kid with average parents and an eccentric grandfather who invents things. One of these inventions is a source of power that is used to fuel a spaceship destined for the moon. Zack stows away on his grandfather’s ship along with a girl named Max. There is some adventure, treachery and maybe even the beginnings of love? I don’t know, as I gave up reading 2/3 of the way through. The pace was excruciatingly slow, the characters were one-dimensional, and I finally set the b Zack Goodspeed is a normal kid with average parents and an eccentric grandfather who invents things. One of these inventions is a source of power that is used to fuel a spaceship destined for the moon. Zack stows away on his grandfather’s ship along with a girl named Max. There is some adventure, treachery and maybe even the beginnings of love? The author, Christopher Mahoney, sent me an early release galley. Perhaps some of the book's flaws were addressed in the final version. The cover art is great, though. While reading this book, the target age of the audience becomes very clear: adolescence-young adult. While part of being a good author is knowing your target audience and writing to cater to their level, I found myself disappointed that the author did not offer enough challenges to his audience. First, the English used was rudimentary and contained too many slang terms and even communication styles that take you out of the fictitious universe he is creating. Second, the story is very linear and While reading this book, the target age of the audience becomes very clear: adolescence-young adult. While part of being a good author is knowing your target audience and writing to cater to their level, I found myself disappointed that the author did not offer enough challenges to his audience. First, the English used was rudimentary and contained too many slang terms and even communication styles that take you out of the fictitious universe he is creating. Second, the story is very linear and does not have enough complicated twists and turns to keep the audience in suspense. I found that when a conflict was introduced it was quickly resolved allowing the reader to take a breath from an adventure that should maintain its pace. Third, the author should take advantage of the literary tools that can be used in order to create a richer reading experience. It took half of the book to bring up any sort of conflict and the way the events unfolded leading up to the conflict was haphazardly presented. Character development is really lacking in this book. The characters seem to remain static throughout the entire novel and Zack's character is not explained very well. Sometimes the author will toy with the idea of giving the characters some depth but this fizzles out almost instantly (for example, when Zack is figuring how things work in his head, which points to the fact that he has the potential genius of his grandfather). There were so many points where the author could have added a wealth of information and development but fell short on going down that route. Most scenes, people and situations were simply explained and did not give the imagination enough building blocks to create a mental picture of what was being described. Since this is a sci-fi book I expected a lot more theoretical inventiveness however, the author keeps making it very clear that this should be read by a younger audience which ruined the book for me. I think it is possible to write a book to a younger audience yet still capture the attention of an older audience that reads the book. This can be done with a little more clever, skillful writing. My overall experience with this book was one of disappointment. The author takes too long to get the story going in the beginning and by the time you read through 3/4 of the book the pace has picked up so fast that it feels like you are fed a plot summary rather than a well paced plot development. I was annoyed at how little Zack grew as a character by the end. Yes, he had tons of adventure, but it would have been more interesting to learn about new skills he developed and new characteristics he acquired through his adventures; the author BARELY touches on this. If there is to be a sequel, I suggest that there is a bit more imagination and craft put into developing the fictional world. The author should dwell a little more on the unique perspectives of each character and not be afraid to spend more time describing the environment as well as how the characters interact with that environment. I would have LOVED to read more about the library, the characters barely used that resource and I think the author could have done a lot more with the education of Zack and Angelina. Pace is important, and it frustrates the reader when the story is told either too slowly or too quickly. Also, details are important, as well as dialogue. I would have loved to read some good dialogue between the children about their perception of space, technology, and interacting with evil. The most that I got from their dialogue was overuse of slang terms and short descriptions of the awe they experienced. I think the author could do a lot more justice to the characters he has created and I challenge him to do that if there is a sequel in the works. I also would like to see that the young audience to whom he is writing be challenged through language that is richer and utilizes the wealthy reserves of the English language. I read the advance readers’ unedited copy, a paperback edition. It has significantly fewer pages (265) than does the hardcover edition (31 4 pages) due out on 2/2/09. I wonder what, if anything, I missed. I’m tempted to read “the whole book” if, in fact, there are significant differences/additions. I did notice some typos, although I also often notice those in final copy published books. I really liked the writing style of this author. This is an engaging story with likeable characters. It’s a ro I read the advance readers’ unedited copy, a paperback edition. It has significantly fewer pages (265) than does the hardcover edition (31 4 pages) due out on 2/2/09. I wonder what, if anything, I missed. I’m tempted to read “the whole book” if, in fact, there are significant differences/additions. I did notice some typos, although I also often notice those in final copy published books. I really liked the writing style of this author. This is an engaging story with likeable characters. It’s a rollicking good time that many kids will enjoy. I see it for 9-13 year olds, both boys and girls, and as an adult who enjoys children’s and young adult books, I liked this book, which is geared to middle school readers. The villain was a bit over the top evil, but it worked ok for me, given the whole story. The kids were empowered, but the adults were not relegated to a back seat either. The reader must be willing to suspend disbelief in order to be entertained by this story, something that I found easy to do. There’s a companion web site where readers can write alternate text, which apparently the author checks, or will be checking when the book is officially published. This makes this book even more appealing to reluctant readers, and reluctant writers too. It could also spark an interest in the sciences, even though it’s science fiction extremely heavy on the fiction. This story is a wonderful blend of fantasy, adventure, and science fiction which means just about perfect for any young reader. The action was exciting and should easily hold the attention span of elementary school students. The climax of the story, when Zack is trying to decide how to deactivate the bomb, is especially well written and worth the effort to get to the end. Great job Christopher Mahoney. *Donated to the Lee County Middle School, Leesburg GA due to the fact that the cover art and s This story is a wonderful blend of fantasy, adventure, and science fiction which means just about perfect for any young reader. The action was exciting and should easily hold the attention span of elementary school students. The climax of the story, when Zack is trying to decide how to deactivate the bomb, is especially well written and worth the effort to get to the end. Great job Christopher Mahoney. *Donated to the Lee County Middle School, Leesburg GA due to the fact that the cover art and story line is appealing to reluctant Jr. High boys. * AR test created by R Lewis McGhee. Since I am a teacher, it's important to keep up with the books my students like and find cool. "The Incredible Origins of the Onyx Sun" is such a book. I struggled with sci-fi in the past, like Madelaine L'Engel's "A Wrinkle and Time". Would this be the same experience? Surprisingly, this was more an action book with events that propelled the plot forward to the point it was difficult to stop after a chapter. Grandfather Goodspeed, the eccentric genius whom we meet as a little boy, seems so unpre Since I am a teacher, it's important to keep up with the books my students like and find cool. "The Incredible Origins of the Onyx Sun" is such a book. I struggled with sci-fi in the past, like Madelaine L'Engel's "A Wrinkle and Time". Would this be the same experience? Surprisingly, this was more an action book with events that propelled the plot forward to the point it was difficult to stop after a chapter. Grandfather Goodspeed, the eccentric genius whom we meet as a little boy, seems so unpredictable we aren't sure what he'll do next. And what are his true feelings about his grandson, Zack? I enjoyed reading Onyx Sun, and read it in two sittings. It was exciting and well paced and Grandfather was a well written character. The book had more humor than I expected, and I actually laughed out loud several times. I'm looking forward to the next book(s)! A fun and imaginative story carries this indie published children's book along, even when the writing is a little rough in spots. And enjoyable blend of fantasy and sci-fi elements. Christopher Mahoney's The Incredible Origins of the Onyx Sun is the story of a 10-year-old boy named Zack Goodspeed whose mysterious grandfather, Fyodor Confucius Goodspeed, is an eccentric genius who invents unthinkably advanced technology as easily as the average person ties their shoes (think Nikola Tesla with the volume turned up to 11). With the help of one of his classmates, Angelina "Max" Maximillian, Zack stows aboard the enormous spaceship his grandfather has secretly built. Together wi Christopher Mahoney's The Incredible Origins of the Onyx Sun is the story of a 10-year-old boy named Zack Goodspeed whose mysterious grandfather, Fyodor Confucius Goodspeed, is an eccentric genius who invents unthinkably advanced technology as easily as the average person ties their shoes (think Nikola Tesla with the volume turned up to 11). With the help of one of his classmates, Angelina "Max" Maximillian, Zack stows aboard the enormous spaceship his grandfather has secretly built. Together with thousands of people from all over the world, they set off to establish a colony on the moon. The pacing was sometimes a problem for me. It only seemed as if the protagonists were in danger when Mahoney wanted them to be. For instance, Zack, Max, and their friend Sanjay had plenty of time to play around with enormous construction/combat machines called “Mechs” in a simulation room, and the danger Machvel poses only rears its head again when Zack and his friends realize that maybe they should start trying to ferret out traitors onboard. On a positive note, however, the Mechs are some of Mahoney’s coolest creations, and I had fun reading about them. Grandfather Goodspeed is potentially the most interesting character, but most of the time he seems more like a writer’s creation than an actual character. For instance, his "bumbling" provides most of the book's humor, but his unerring genius provides the book with its basic plot. How are these two sides of his personality reconciled? They're not. And maybe they're not supposed to be, but for the most part I thought it made him a more unbelievable creation than a nuanced character. For instance, down on earth he consistently blows up his laboratory in classic goofy mad scientist fashion, but is still able to supervise construction of an enormous spaceship that can take thousands of people from the earth to the moon, and that seems technologically a century or two ahead of its time, and that features so many unnecessary bells and whistles I was surprised that it was ever able to actually take off. Grandfather Goodspeed's private quarters feature such byzantine accoutrements as sheer black tiles, two curved stairways, black leather couches that levitate above the floor, and a solid gold statue. The wall at this end was decorated like an altar. A series of wide stairs led from the floor, covered in blue and purple rags edged with gold. Towering, stone statues of the titan Atlas rose up on either side of the back wall, his muscles straining from the vast globe he carried on his back. In between these statues was a stained glass window that stretched from the floor to the ceiling and glowed with golden light. Unlike other stained glass windows Zack had seen on Earth, this one was composed entirely of frosted white glass and edged in a golden frame. The glass formed the figure of a mostly bald man in spectacles holding a cube in one hand which radiated brilliant light. Zack realized in shock that the man was his grandfather. Hubris, anyone? If this were a Greek myth (especially one about the dangers of flying too close to the sun), those gigantic stone statues might make the spacecraft too heavy to take off in the first place, but instead, it's just a bit of Ayn Rand-style glorification of the individual without any regard for reality. I know that the Onyx Sun supposedly provides nearly limitless power with zero emissions or byproducts, but honestly, this is more "magic" than it is "science." The first half of the book is really a fun and intriguing read that both young and old will like. A 5 all the way. Two kids make an alliance to figure out what Zack's crazy (in-genius) inventive grandfather is up to. It results in some great adventures ending up on a space ship his "crazy" grandfather has created and going to the moon and beyond. It holds a promise of really a great adventure into space. Suddenly after landing on the moon the story changes and an evil man with an evil plot pops o The first half of the book is really a fun and intriguing read that both young and old will like. A 5 all the way. Two kids make an alliance to figure out what Zack's crazy (in-genius) inventive grandfather is up to. It results in some great adventures ending up on a space ship his "crazy" grandfather has created and going to the moon and beyond. It holds a promise of really a great adventure into space. Suddenly after landing on the moon the story changes and an evil man with an evil plot pops on the scene out of the clear blue and the story changes from an adventure in space to espionage and killing and deception. The fun and exciting part of space travel slips away and it becomes more a battle of survival. In fact the rest of the book is really trying to survive against the evil who has tried to destroy them and in turn plans to destroy the world. Sort of a batman type story. There are interesting science fiction aspects from unlimited power cubes to giant robots and 15 second learning files but they are grounded on the moon now and so the promise of space travel and all that never comes to fruition. The last half of the book revolves around now three kids, one being a true part of the crew, and a great friendship ensues. And the bond between Zack and Angelina grows into something very precious. These three take on the evil one practically on their own with virtually no help from his grandfather or the rest of the crew who seem to want to ignore the evil and work on establishing a base on the moon. This whole separation issue seems very unreal and when the three actually save the ship and the crew from what would have been sure destruction they get punished by his grandfather and the rest of the crew. This second half of the book has some challenging issues and great adventures but now it is not against space as much as fighting a crazy evil person bent on destroying the world. The direction of the story changing in the middle of the book changed the enjoyment of the read and the plausibility of the story. It is still good but seems to loose the great writing of the first half and becomes more of just another good/evil story and not all that much of plot anymore. Christopher Mahoney: Your future's so bright, you gotta wear shades! This novel is the start of something great for you! I wasn't sure what to expect when I started this book. I thought it would be another one of those middle school/young adult sci-fi stories which would lose my interest after the first few chapters due to being too bland, too technical or too monotone. Happily, I could't have been more wrong about my preconceptions of this book! First of all, it wasn't strictly sci fi; it was mo Christopher Mahoney: Your future's so bright, you gotta wear shades! First of all, it wasn't strictly sci fi; it was more of an action/adventure story which just happened to take place in space. I don't want to see it being limited in its audience potential by being classified strictly as sci fi. However, young sci fi fans will still enjoy it, along with all boys and girls who just happen to like a good story. I thoroughly enjoyed the author's writing style; it was smooth, descriptive yet not long-winded, and it kept my interest through to the end. From the first paragraph of Zack's story I was hooked. Once Mr. Mahoney laid the foundation, it was a fast-moving train from there on out. The action started early on and continued gaining speed, not slowing down until the very end of the book. Zack Goodspeed is a normal 10 year old boy with a normal family and an extremely normal life, who through his not so normal scientist Grandfather Fyodor, goes on the adventure of a lifetime. It was pleasantly easy enough to connect with the different characters, Zack, Angelina (nicknamed 'Max'), and Sanjay, but I especially loved Fyodor who reminded me of "Doc" from the Back to the Future movies. What a cool grandfather to have! I sincerely hope Mr. Mahoney is planning sequels to this book. I will definitely buy them, and will be re-reading this one in the future until then! Zack is burdened with a lovable grandfather who is considered a bit of a crackpot, more dreamer than is practical, and given to unexplained disappearances. Zack and his plucky friend Angelina decide to follow Grandfather one day and find out where he disappears to. What they find out is beyond what they could have imagined. Grandfather turns out to be quite a genius, although a loveably eccentric one. Who occasionally brought to my mind vague remembrances of Commander Caractacus Pott and Willy Wonka. Zack's grandfather has actually built a space ship, which he plans to take to the moon to establish a base there. Zack and Angelina stow away, and the adventure begins. One of my favorite parts was the series of puzzles that are part of Grandfather's security system that Zack and Angelina have to solve in order to follow him. It was quite a bit of fun to experience with Zack and Angelina. Loved it. What a fun series this is going to make. I've said it before , but I'll say it again. If a book doesn't manage to capture all my emotions then I just wont finish it. This one definitely works for me. Fy Goodspeed is an excentric inventor that at times seems absent minded, but has a good heart. His grandson Zack thinks the world of him. Zack wants to be a bigger part of his grandfather's life and ends up on the adventure of his own life in the process. I don't want to ruin t Bravo Chris! Fy Goodspeed is an excentric inventor that at times seems absent minded, but has a good heart. His grandson Zack thinks the world of him. Zack wants to be a bigger part of his grandfather's life and ends up on the adventure of his own life in the process. I don't want to ruin the read for others by giving too much away, but this is a book that is sure to please. My boys loved it. I will be purchasing a couple of copies to donate to my kiddo's school libraries and encourage you all to do the same. Let's get great books like this circulating. This is one of those books that I wish we hadn't read so fast because now we have to wait until the next one comes out to continue along with the adventure. I'm thinking this is going to be a movie soon. Anyone else thinking that? This book is about a boy named Zack Goodspeed. He's normal, but his grampa is not. His grampa is makes inventions, lots of inventions. Zack thought he knew everything about his grampa. Until he finds an elevator in the woods. At the bottom he finds.... wait I can't ruin the story for you. You will have to read it for yourself. I really liked this book. It keeps you reading. If you think this book is a boring science fiction novel with aliens, well, you're wrong. No aliens, but lots of adventure This book is about a boy named Zack Goodspeed. He's normal, but his grampa is not. His grampa is makes inventions, lots of inventions. Zack thought he knew everything about his grampa. Until he finds an elevator in the woods. At the bottom he finds.... wait I can't ruin the story for you. You will have to read it for yourself. I really liked this book. It keeps you reading. If you think this book is a boring science fiction novel with aliens, well, you're wrong. No aliens, but lots of adventure. Personally if I pick up a boring book and try to read it my brain shuts down. With this book my brain as 100 percent allert. I really liked this book and I know you will too. Before I begin, I should mention that this is a review of an advanced reading copy and thus, the views expressed here may not be 100% indicative of the final product's quality. That being said, this is one of those books that has a lot going for it, but is so frustrating and aggravating that any redeeming value it has is buried under it's continuous attempts to annoy its reader. It's pretty obvious from the outset of The Incredible Origins of the Onyx Sun that Christopher Mahoney, or at least his Before I begin, I should mention that this is a review of an advanced reading copy and thus, the views expressed here may not be 100% indicative of the final product's quality. That being said, this is one of those books that has a lot going for it, but is so frustrating and aggravating that any redeeming value it has is buried under it's continuous attempts to annoy its reader. It's pretty obvious from the outset of The Incredible Origins of the Onyx Sun that Christopher Mahoney, or at least his book, possesses a serious contempt for normality. Right away, and throughout the book, anyone labeled as normal, namely our main character, Zack Goodspeed's, parents are shown to be boring, unreasonable, prone to anger, distrusting and insulting. I think I can kind of see what's trying to be accomplished message-wise in the book, that we're cheating ourselves out of the full life by living it normally and by the routines society deems acceptable (or the cliches surrounding what society deems acceptable, anyway), but it's presented in such a way that it's distracting and more than a little aggravating. There's so much wrong with the presentation of the book's theme. For one, it just completely and utterly insults and degrades its opposing view with no acknowledgement of its value. It's an approach that makes me think that this book would fit in well in the world of politics. Secondly, the presentation is so redundant that I'm not entirely sure that even if I was in the target age group that my intelligence wouldn't have been insulted. At the very least, I know it would have bored me. The word "normal" occurs just within the first few chapters numerous times, and almost each occurrence precedes some type of negative remark. I didn't count (though now I wish I had), but I wouldn't be surprised if the word occurs anywhere from 30-40 times. And that's just within the first five chapters, let alone the whole book. It's a shame that this book carries around such a sour attitude, because it really spoils many of the good things it has going for it. For example, the plethora of fascinating technologies (I really want to get me some Memo Files) and the decent overall story. It would all make for a pretty good book if it wasn't so smug, and really, those positives are the only reason I didn't abandon the book altogether. That and the fact that I was kindly the recipient of a free copy. Few genres tempt me into nitpicking territory like Children's Literature, and while I can resist the urge normally, this one just has stuff in it too ridiculous to ignore, all of them related to science. • Disregarding physics completely, Zack is at least twice mentioned to hear something outside while on the surface of the moon, where there's nothing to carry sound to his ears. • So much glass. I find it hard to believe that people so intelligent would build spaceships with so many structural weaknesses where a simple crack can quickly turn deadly. There's even an entire building made out of it! • The Onyx Pioneer is a ship that is described to be large enough to carry an Olympic size swimming pool, multiple basketball courts and football fields, 30 mechs whose mere fingers are "the size of electrical poles", a crew of 50,000 people, a hangar bay that could house an entire city, and enough material to build a multi-towered space station on the moon that would extend from the bottom to above the top of the Aitken Basin (an impact crater on the moon that is 8.1 miles deep, meaning that the station would be high enough to scrape the bottom of almost any commercial plane). This massive behemoth somehow launches from the Earth to outer space without causing any major (or minor) earthquakes or damage to the planet. There's suspension of disbelief, and then there's just complete disregard for how the universe works. There's a part of me that wants to give this book a two star rating because I can't disregard that there's a decent book hidden in here that I enjoyed at times despite all the spiteful messages and the less than stellar research that went into it. But I can't bring myself to do it. Maybe if the dialogue wasn't so repetitive, or we got to see more of the villain, then maybe. But that is not the case, unfortunately, so one star it is. When I was Zack Goodspeed's age, I met Captain Kirk and his merry band of crew members on the good ship Enterprise. All science fiction/spaceship/boldly go where no man has gone before type tales always bring me back to the Enterprise. It's a character flaw, or perhaps an endearing quirk. Who knows. In this story, we have young Goodspeed, and his pals boldly going to the moon aboard Grandfather Goodspeed's amazing ship, powered by his even more amazing energy source, the Onyx Sun (a nice oxymoron When I was Zack Goodspeed's age, I met Captain Kirk and his merry band of crew members on the good ship Enterprise. All science fiction/spaceship/boldly go where no man has gone before type tales always bring me back to the Enterprise. It's a character flaw, or perhaps an endearing quirk. Who knows. In this story, we have young Goodspeed, and his pals boldly going to the moon aboard Grandfather Goodspeed's amazing ship, powered by his even more amazing energy source, the Onyx Sun (a nice oxymoron to call this jet black cube sun. It pleased me.) At first, I found myself a little distracted by things such as calculating Grandfather's approximate age (Hey! He and I were probably litter-mates! I wonder if he was really the brainiac in my 6th grade class who won the science fair?) But I settled in, fastened my seat belt and sent on a onyx sun charged ride. The basic story is entertaining, and fun, if a tad predictable. (I mean, come on-- if you meet a character named Dr Machvel, how can anyone who has ever been exposed to The Prince not suspect he might be a bad guy. But, since most of the readership probably won't have read that particular book yet, it's probably okay.) I won't go into a plot summary, because that can be read elsewhere. I did get a little eye-glazy with some of the descriptions of how things worked or looked. It made me realize that probably a lot of authors, myself included, may write more towards how things would look in building a set or on camera than in a person's head. Or maybe you need to be a 10 year old boy to picture it in your mind. My view of the ship kept looking like the Enerprise But again, I digress. Grandfather's version of mad-scientist is charming -- I tended to see him as a cross between Mark Twain and Columbo, but with a peculiar hairdo, described early on in the book. Zach is a basic boy, with a bit of extraordinary skills that become more apparent as he moves through the story. One of his more endearing characteristics for me is that he gets motion sick pretty easily. It's his Achilles heel, or the kid version of Indiana Jones and snakes. Nice touch, from a reader who pukes on roller coasters. Made him more real. There's lot's of room for his character to expand and fill out in sequels, for yes, I would bet there are sequels in store. Angelina is a great character -- a bit of a wildcard and daredevil. I enjoyed her somewhat callous, yet vulnerable view on the world. Sanjay rounds out the kid trio with down to earth geekiness. I longed to get my hands on some of those learning files, and enjoyed the learning process the kids went through about the ship. As a neurological nurse, I worried about all the head injury/trauma Zach particularly seemed to suffer with all the blackouts. And there were a few other parts where my practical adult/parent mode kicked in, until I reminded myself to go back to a kid-reading-this mode. I also want to explore the website and wish I had access to some of the interactive stuff alluded to on the final page of the book. I recently read another book by another author geared at the same target audience, but found myself turned off by the author trying to appeal to all reading audiences with his cleverness and allusions. Christopher Mahoney didn't forget his target audience, which is good. He stays true to them, but allows the rest of us to come along for the ride. I think kids will enjoy this, especially because it's other kids not so much as outsmarting adults, but in leading adults. It's not an us-against-them situation, as much as teamwork, where the generations work together. Again, nice touch. I have a suspicion my nephew might enjoy this book, so will probably pass along one of my copies to him to read. Think of him as Zach, but with Sanjay's skill set. He'll probably have no trouble picturing how the ship looks, and will tell me all the ways my mental image is wrong. Beam me up, Scottie! Another rave from a 5th grade boy. I failed in my attempt to get a girl interested, but there's always tomorrow. So, I assume I was correct in my comment: It could very well be that this is one of those kids books that appeal to kids, but not adults. There are quite a few out there. I don't think kids would question as many things as I did and I do think the idea of three children saving the world would be much more interesting to a 10 year old than to an adult. I may add another star depending on the review from the 5th grade boy I gave it to him today. He is also an avid reader, so I expect feedback from him in just a day or so. I would like to say that I am enjoying passing along a book and sharing feedback with my students. I think I will make this an ongoing thing! Next time, this book goes to a reader of the female persuasion! I won an ARC through Firstreads. I read a lot of YA/Children's books. I will have to say I was intrigued by the beginning. I enjoyed Zack and Max trying to follow Grandfather and solving all the riddles. However, somewhere around page 100 I just stopped caring about what happened and I just wanted to finish the book. It took me about 4 days to get through the last third. I think the characters needed to be developed more. It's like we didn't really get to know any of them all that well. The story idea was good, but I just didn't buy some of the plot twists. Conflicts were not detailed enough and solutions came way too quickly and easily. I find the idea that Machvel was able to convince 25,000 people to A. mutiny and B. keep it a secret a bit far-fetched! Grandfather doesn't have access to all the files on his own ship but 3 kids were able to get that information? Now, I know this is a book written for children so I gave it to one of my students and asked them to give me an honest response. I did not tell them that it fizzled out for me. It could very well be that this is one of those kids books that appeal to kids, but not adults. There are quite a few out there. I don't think kids would question as many things as I did and I do think the idea of three children saving the world would be much more interesting to a 10 year old than to an adult. However, I think one sign of a great novel for children is that it captivates readers of all ages. One last thing: as a teacher I like novels that have higher vocabulary. I KNOW the students do not know what the words means and either only get a slight impression of the word through context or simply skip over it and keep reading. However, if children are never exposed to those words, they will NEVER learn them. So “Onyx Sun” was my first good reads book, and to that I am grateful to Christopher Mahoney. It is an advanced readers copy and first impressions were that for a self printed book it was bound quite nicely. I thought that the cover art could use a bit of work, contrary to the popular saying, people do judge books by their covers. This cover was a bit over the top, I appreciated the elements of the story they were trying to convey but I asked my 8 year old “niece” and she said that it looked kind of silly. That being said, the story is quite interesting and imaginative and I think it is one she would like, but due to the cover she changed her mind. So, I think perhaps, a picture of the Onyx Sun, or of the Ship on the Moon, or of the moon itself since a majority of the story takes place there. I think that a reboot of the cover would entice more children to be interested in this book. On to the story. It’s all about a 10 year old boy, Zack, whose grandfather is a super genius inventor, and the boy is the only one in his family who really identifies with the eccentric old man, Fy. I thought some of the things that Zack did were a little fantastical considering he is only 10, but he is supposed to be a bit of a genius himself, so I allowed my imagination to run a bit wild which made the story totally plausible. I really enjoyed Fy, I thought he was wonderfully developed and expressed, and it was nice to have an imaginative older character in a children’s story. I appreciated that, because to me it seemed like he didn’t lose his creativity like age like some characters are wont to do in other children’s stories. It was like he never really grew up. I thought that Zack was cool, and a good example of what determination and imagination can do for children. I found Max to be a bit annoying, and well she lent that necessary toughness and oomph that was called for in the story line. But, overall I just didn’t really want to know about her. I wanted to know about Fy and Zack. I thought the idea of a black cube being a never ending was a neat idea and a good way to teach children about renewable energy and the wastefulness of many of our main energy source. I liked the idea of starting a secret moon colony on the dark side of the moon. In fact, the scene in which the engineer is describing how they will sustain life on the moon colony was my favorite out of the entire book. It made me wonder if that could really work, and it set me into creative hyper drive. The bad guy plot was a bit predictable, but I am a 23 year old reviewing this book for 10 year olds, so to them it is probably less obvious. I enjoyed the action scenes, and I liked how all the characters ended up in the end, it wasn’t perfect and I appreciated that, but it wasn’t terrible either, it fit them perfectly. All in all, I enjoyed the book. I think it is great for 3rd-5th graders perhaps younger if they have a good attention span and are advanced readers. I like that it will get them to use their imagination and think of all the different ways science is fun. It is perfect for boys and girls, which is also rare in books these days. Honestly my only complaint is the cover, but that is minor. So my advice is to ignore the cover and give this book a try, I think your little boy and or girl will thank you for this fun filled trip into a sci-fi filled world of zany, creative inventions and wonderful characters. Zack Godspeed is a pretty normal ten year old kid, he has a mom and dad who love him and he lives in a normal neighborhood. He loves baseball and he hopes to make friends. What sets him apart from the other kids is that he is very smart and he has a a very abnormal Grandfather. His grandfather is not just odd but even looks odd. He is extremely tall and thin, bald except for a tuft of white hair that sticks out from the front of his head and he wears nothing but white. No other color whatsoever. Zack Godspeed is a pretty normal ten year old kid, he has a mom and dad who love him and he lives in a normal neighborhood. He loves baseball and he hopes to make friends. What sets him apart from the other kids is that he is very smart and he has a a very abnormal Grandfather. His grandfather is not just odd but even looks odd. He is extremely tall and thin, bald except for a tuft of white hair that sticks out from the front of his head and he wears nothing but white. No other color whatsoever. Due to the oddity of Zack's grandfather whom he loves very much he is constantly picked on at school. Today was no different, when Tom Riley the school bully shoves him down and takes his beloved baseball. This time however he is rescued by the strange new student Angelina Maximillion. She is known as Max, well respected by the other students although she only has a few friends, mostly just the boys. She lives with a foster family and has been moved around frequently. When Zack turns to thank her, she has disappeared. Zack's grandfather frequently disappears for days and sometimes months and no one knows were he goes. He often shares secrets with Zack and shows him things he is working on. During his most recent visit he shares a huge secret with Zack. he has discovered a large power source he calls the Onyx sun and has made a Onyx powered aircraft. "Kalamazoo" and off they go. When his grandfather drops him off he makes him promise to keep this a secret. Zack is grounded for being gone so long with no good explanation and as he sits in his room he notices lights in the woods behind his grandfathers house. In the light he can see his grandfather disappearing into the woods. Just as Zack is ready to sneak out he gets a surprise visit from Max, the girl from his school. she too has been watching his grandfather and they decide to follow him. Little do they know that in making this simple decision, they will be thrust into the depths of the earth, ride a rocket to the moon, face numerous life threatening situations and finally save the earth and the future of all mankind from destruction. What Zack finds are very good friends and that being abnormal like his grandfather is a very good place to be. This is a wonderful read. It is zany and absurd and incredibly fun. The characters are engaging and the story is just short of amazing. This is a great read for the YA and will keep them entertained for hours. The action is fast paced and incredibly well thought out. Christopher Mahoney has hit this one out of the Ballpark. I received this book as a free copy from Goodreads First Reads. I am not receiving any compensation and all opinions are my own based off my independent reading of this material. Zach doesn’t really fit in with his parents. They are almost boringly ordinary. They seem to have no creativity or imagination and it is almost painful how they don’t understand their son. Zach does take after his grandpa Fyodor, an inventor. Although his parents don’t want his grandfathers oddness rubbing off on their son, Zach tried to be with his grandfather every chance he gets. The problem is Fy is often gone for long periods of time. So, when Zach’s classmate Angelina “Max” Maximillian tell Zach doesn’t really fit in with his parents. They are almost boringly ordinary. They seem to have no creativity or imagination and it is almost painful how they don’t understand their son. Zach does take after his grandpa Fyodor, an inventor. Although his parents don’t want his grandfathers oddness rubbing off on their son, Zach tried to be with his grandfather every chance he gets. The problem is Fy is often gone for long periods of time. So, when Zach’s classmate Angelina “Max” Maximillian tells him that she knows where Fy goes. Zach and Max follow Fy and sneak aboard The Onyx Pioneer. There they learn that Fy is planning on setting up a colony on he moon and using his unlimited power source, the Onyx Sun, to power the colony. Unfortunately, other people are interested in the Onyx Sun’s powers, but not for such a good cause. Now Zach, Max, and Sanjay, a boy from the colonists, are trying to figure out where the Onyx Sun’s thief is hiding on the moon. They are on a race with time since the colony cannot survive for long without the Onyx Sun powering the colony. I really liked this book. There was great action and adventure, a wonderful story, and a great lead character. Zach learns to appreciate his boring parents and understand why his grandfather goes away for long periods. I had a hard time putting the book down. This book is geared toward children but I feel everyone will like this book. I received this book for free from the Library Thing First Reader program in exchange for an honest review. I originally got this book through a friend of a friend. For a first book, the author has really done quite well. I could visualize almost every scene as if it was a book form of a movie. I agree with other reviewers here that the writing at times was a bit basic, but then I reminded myself that this book was for middle graders. Often when the protagonist is young, in this case 11, then the book's target audience is a few years younger. So, if I remember what I was reading at 9 or 10, I think I w I originally got this book through a friend of a friend. For a first book, the author has really done quite well. I could visualize almost every scene as if it was a book form of a movie. I agree with other reviewers here that the writing at times was a bit basic, but then I reminded myself that this book was for middle graders. Often when the protagonist is young, in this case 11, then the book's target audience is a few years younger. So, if I remember what I was reading at 9 or 10, I think I would have enjoyed this story greatly as an introduction to science fiction. The version I read was the advance review copy, but I also later purchase the hardcover. The hardcover cleans up the spelling mistakes in the review version. It also has a new first chapter that I enjoyed better. There are a bunch of black and white drawings too at the start of each chapter that I liked. It shows a lot of professional work to self-publish a book of this quality. The drawings would almost reminded me of some of the graphic novels my friends here in Japan like. books with real world math and science problems. It's an ambitious project and a fantastic book that should appeal to kids everywhere. Who knows, Zach could well be the next Harry Potter! This book was an interesting and unique story about a boy named Zach Goodspeed and his crazy inventor grandfather. The beginning was pretty slow and it took me a long time to get into this book. The book wasn't that long and it took me over a month to finish reading it. I feel like the writing was lacking a little. Once Zach paired up with his neighbor "Max" and they agreed to go after his grandfather and see what he was up to the story got interesting. It was fun reading about all the neat inve This book was an interesting and unique story about a boy named Zach Goodspeed and his crazy inventor grandfather. The beginning was pretty slow and it took me a long time to get into this book. The book wasn't that long and it took me over a month to finish reading it. I feel like the writing was lacking a little. Once Zach paired up with his neighbor "Max" and they agreed to go after his grandfather and see what he was up to the story got interesting. It was fun reading about all the neat inventions and life on the space ship. I don't know if I had a problem with the writing style because I'm not part of the target audience or not. My 9-year old son picked it up and said it looks interesting. If he ever gets around to reading it I will post another review. I gave it three stars because I liked the idea of the story and the characters. What thrilled me in the beginning of this read, is regardless of what grandfather Mr. Goodspeed experienced in the fourth grade, he did not give up on his dream of bringing the "Onyx Sun" experiment to life. He reminds me of a scientist emerging and enhances the spirit of the "onyx" powers that be. His grandson, Zack Goodspeed, becomes intrigued with his grandfather's inventions and brings his friends along for the ride (Sanjay and Angelina "Max" Maxmillian). Join the author, Christopher Mahoney, What thrilled me in the beginning of this read, is regardless of what grandfather Mr. Goodspeed experienced in the fourth grade, he did not give up on his dream of bringing the "Onyx Sun" experiment to life. He reminds me of a scientist emerging and enhances the spirit of the "onyx" powers that be. His grandson, Zack Goodspeed, becomes intrigued with his grandfather's inventions and brings his friends along for the ride (Sanjay and Angelina "Max" Maxmillian). Join the author, Christopher Mahoney, on this adventure! I would like to see this as a movie or TV series instead of reading it, this is how I envisioned it as I am reading most of the scenes in the book. Recommended for 4-6th graders. Maybe 7-8th grades too. Rating: Wow, what a Dream! 3 stars. Where was this book when I was a kid?! I wasn't sure what to expect when I won this book as a first reads book, but I am glad that I was given the chance to read and review this book. If you have a kid who is adventurous and you want to get them into reading, this is definitely a book for them. The quirky characters and sarcastic undertone at the beginning draws you into the book. The the funny situations Fy and Zack get into, and then later on Max, keep the book rolling. As a reader, you don't Where was this book when I was a kid?! I wasn't sure what to expect when I won this book as a first reads book, but I am glad that I was given the chance to read and review this book. If you have a kid who is adventurous and you want to get them into reading, this is definitely a book for them. The quirky characters and sarcastic undertone at the beginning draws you into the book. The the funny situations Fy and Zack get into, and then later on Max, keep the book rolling. As a reader, you don't want to put the book down because you want to see what kind of misadventure the kids (and grandpa (grandfather)) are going to get into next. However, if you do need to put the book down for some reason, the chapters are short enough that it is easy to find a stopping place without being in the middle of a scene. A very strong debut novel for the younger set. It is precisely the sort of book I would have adored when I was ten and deserves a place in every school library. It has the same flavor as one of those Saturday morning animated specials they would do on ABC when I was a kid, probably hosted by Captain OG Readmore (for those that remember back that far!). There are even a couple of great visual gags, which are among the hardest things to capture in print but handled with great aplomb. If I had a quibble, it is a minor one, in that at times the descriptions of the fantastic technology are, erm, too descriptive. It is a very fine line between explaining sci-fi concepts and allowing the reader to imagine it for themselves. Well I've finished the book! I enjoyed it. There were definitely some typos and accuracy issues (and since this is an ARC I'm not sure if any of these issues are in the final version), but overall it was a great story line with fun characters. There was a meaningful plot and great resolution, while still leaving it open for a second book. I had a lot of fun reading it. I love short chapters, so I thought it was great that they were all very short. It makes me keep reading when I know the chapter Well I've finished the book! I enjoyed it. There were definitely some typos and accuracy issues (and since this is an ARC I'm not sure if any of these issues are in the final version), but overall it was a great story line with fun characters. There was a meaningful plot and great resolution, while still leaving it open for a second book. I had a lot of fun reading it. I love short chapters, so I thought it was great that they were all very short. It makes me keep reading when I know the chapter is only a few pages verses 40 pages. Thanks goodreads and Christopher Mahoney! I started writing when I was seven, but it took me twenty years and about ten unfinished manuscripts to find a story I felt compelled to finish. My debut novel, The Incredible Origins of the Onyx Sun, has gone on to win a Writer's Digest award and was one of 50 remaining submissions from a field of 5,000 in the Semifinals of the 2010 Amazon Breakthrough Novel Awards. The Incredible Origins of the I started writing when I was seven, but it took me twenty years and about ten unfinished manuscripts to find a story I felt compelled to finish. My debut novel, The Incredible Origins of the Onyx Sun, has gone on to win a Writer's Digest award and was one of 50 remaining submissions from a field of 5,000 in the Semifinals of the 2010 Amazon Breakthrough Novel Awards. 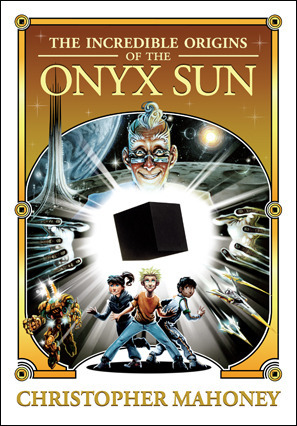 The Incredible Origins of the Onyx Sun follows the adventures of Zack Goodspeed, a kid I once imagined myself to be, who stows away on a spaceship developed by his grandfather and fueled by an unlimited source of power called the Onyx Sun. Zack is thrust into an adventure that strands him on the Moon, introduces him to bold new friends, and pits him against an enemy trying to use the Onyx Sun to wipe out all life on Earth. I am currently promoting this book, the first in a series, while working on the sequel, The Wicked Adversaries of the Onyx Sun. My main interest for the last 34 years and an immense inspiration for my book, is technology. I currently work for Sony Playstation but have also held senior manager positions at Second Life, and the online division of Houghton Mifflin. I share a birthday with Douglas Adams, who is ironically one of my largest influences.